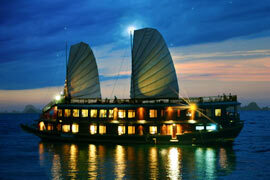 Pick up & transfer to Ha long – Upon arrival at Bai Chay/ Ha long transfer by tender to boat .Embark & enjoy welcome drink. Check-in cabins . Lunch is served while the boat starts cruise around Ha long bay. Transfer from boat to visit Cua Van Fishing Village by tender. Depart by boat to Soi Sim Beach for swimming & relax . Depart by boat to Luon Bo Area, where the boat anchors for overnight. Dinner & enjoy traditional music performance. After dinner, enjoy movie or relax on sundeck , or joint squid fishing with crew. Overnight on the Junk. A morning Tai Chi exercise with an opportunity to view the sunrise over the bay. Depart by boat to Surprise Cave (Sung Sot) to visit the famous cave. Return transfer by tender to boat. Have breakfast. Check-out cabins. Disembark by tender .Pick up & transfer to Hanoi by car. English speaking local guides on boat.